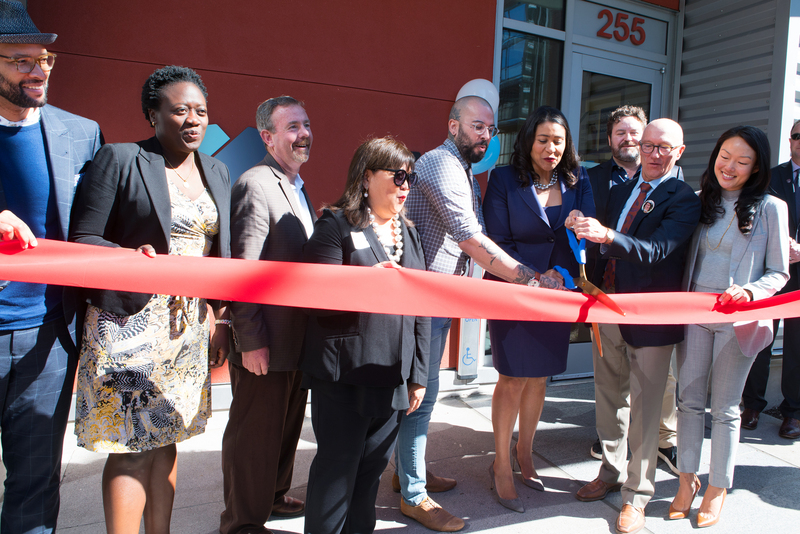 October 16, 2018 (San Francisco) Mercy Housing and Mayor London Breed celebrated the opening of 190 affordable family apartments in Natalie Gubb Commons. The affordable homes were developed as part of the Transbay Redevelopment Project Area, spearheaded by the Office of Community Investment and Infrastructure (OCII). Natalie Gubb Commons is part of a mixed-income, joint venture between Mercy Housing California (MHC) and Golub Companies LLC. The combined site also includes 409 market-rate homes. David Arpi, Natalie Gubb’s widower, shared some emotional words with the event’s attendees about his late wife Natalie Gubb. Natalie was among the true leaders of the affordable housing world, having been instrumental in drafting the Low-Income Housing Tax Credit (LIHTC) in 1986, which is the building block of nearly all affordable housing development since that time. Along with her many professional accomplishments, these new homes are a testament to Natalie’s legacy of spirited advocacy, unrivaled knowledge, and generous friendship. This development was among the last projects that Natalie worked on with Mercy Housing before she passed away.